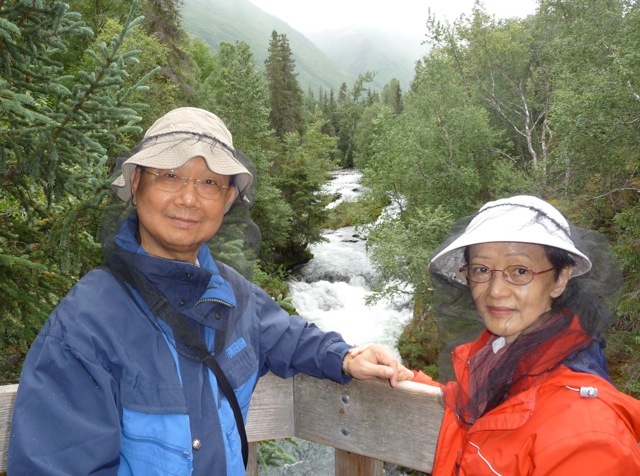 Sally and I visited Alaska by cruise ship years ago and we immensely enjoyed it. 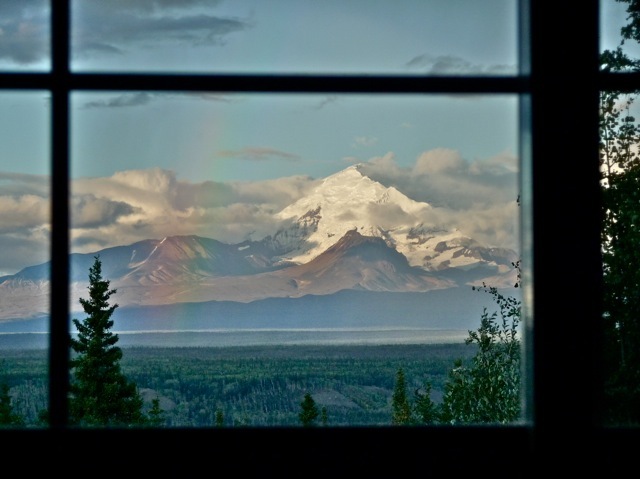 We decided to tour Alaska by car this August when the weather was warm and daylight was long. We drove for 12 days and made a big circle around settled areas of Alaska, and we again immensely enjoyed this trip. 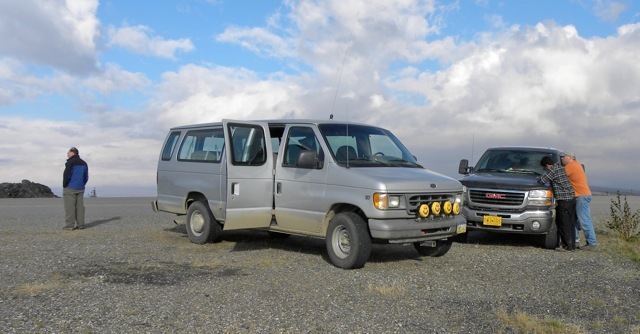 Having never driven in Alaska and knowing the population density is sparse, I researched and made lodging reservations for every night of the trip. Finding the cost of lodging to be very high, I limited my selections under a certain maximum price. Based on web reviews and availabilities, I made reservations and hoped my pokes-in-the-dark pan out OK.
To our happy surprise, at least half of our lodging were excellent. For a relative low price, our room in the Copper River Princess Wilderness Lodge faced the snow-covered Mt. Drum. And we were even treated to a beautiful rainbow by the mountain. At another Princess Lodge, we had a wood burning heater in our room. 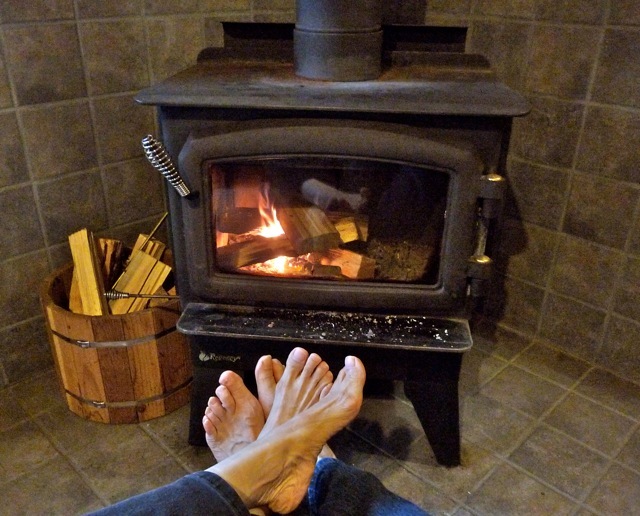 It was wonderful to toast our feet by the burner on a crisp cool night. 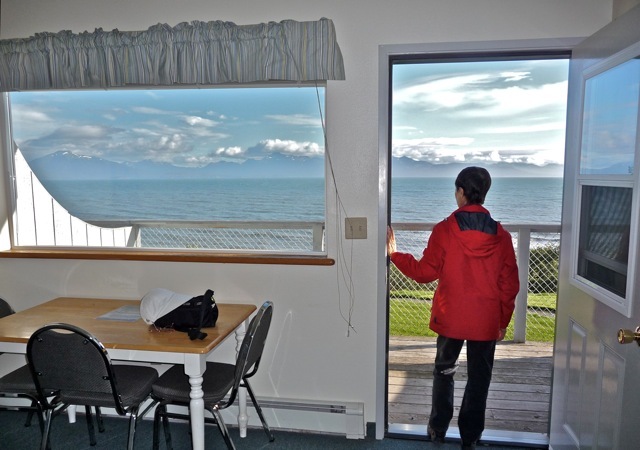 Out motel room in remote Homer was next to the ocean with a distant view of the mountains across the sound. But we also lost some bets. We paid motel price for a cabin at a hostel, and were astonished that our cabin was a small, simple wooden box. We forfeited three nights’ pre-paid fee and checked into a reasonable lodging nearby. Some people like to tour Alaska like snails, carrying their homes on their backs. 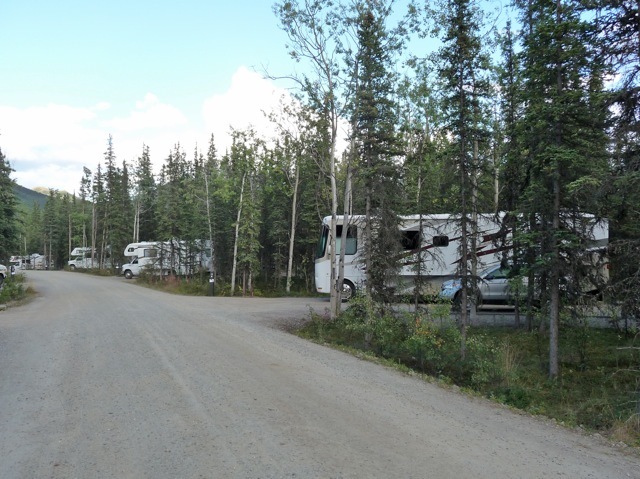 Recreation vehicles (RV) find camp grounds easily, and this one among trees in the Denali National Park is particularly comfortable. 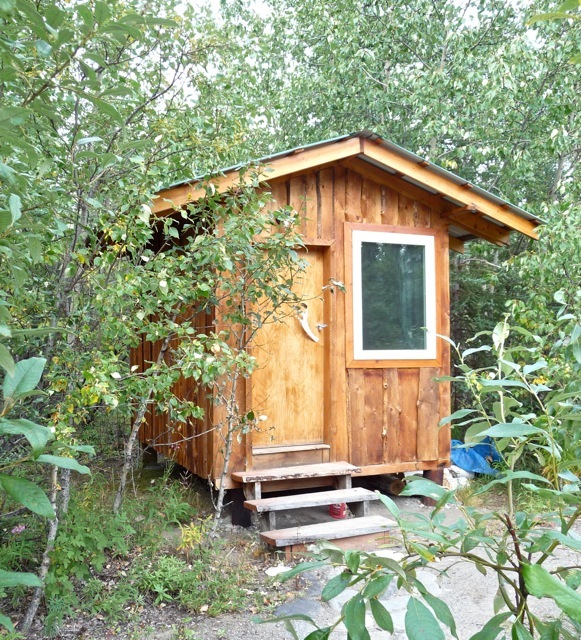 Some local people rent one room cabins short term, like these by the highway. 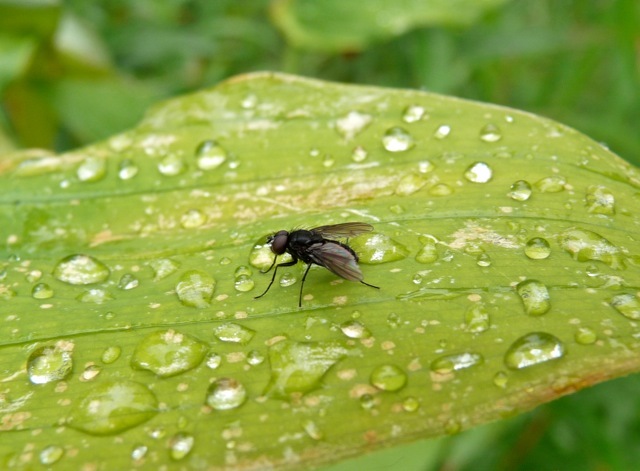 The scourge of Alaska is the swarms of biting flies and mosquitoes. They were at their height in June, and subsided somewhat by August. 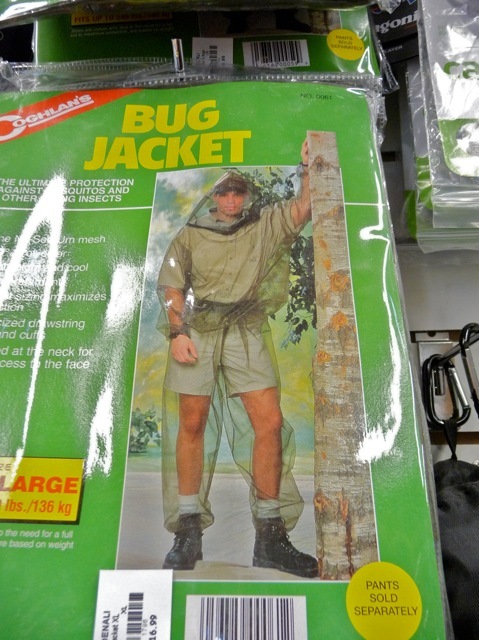 To ward off the swarms of biting flies, some Alaskans wear full body suit of mosquito net. I made mosquito nets for our heads and wore them during our walks in the woods. The mosquitoes buzzed us, but left frustrated and hungry. 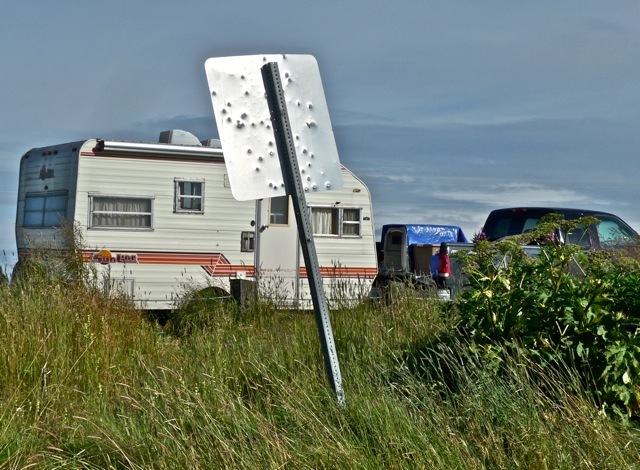 Almost every traffic sign in Alaska is full of bullet holes. I guess frustrated Alaskan hunters shot at the signs when they could not find animals to shoot. 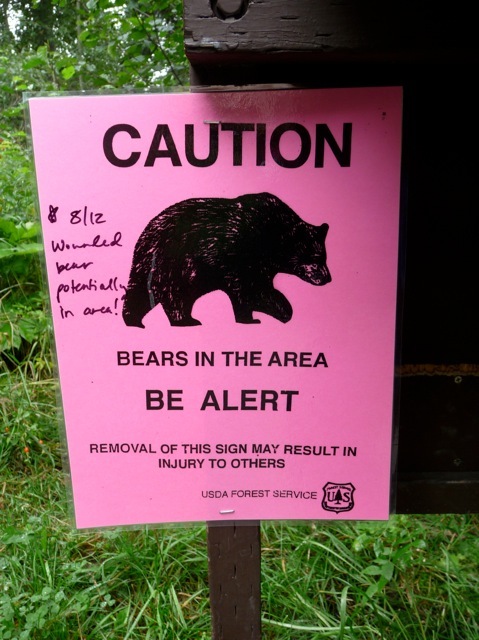 During one of our walks, we saw this warning sign about a wounded bear sighting. Fortunately, we did not see it in our 5-hour hike. Some other hikers were wishing to see this bear, though. 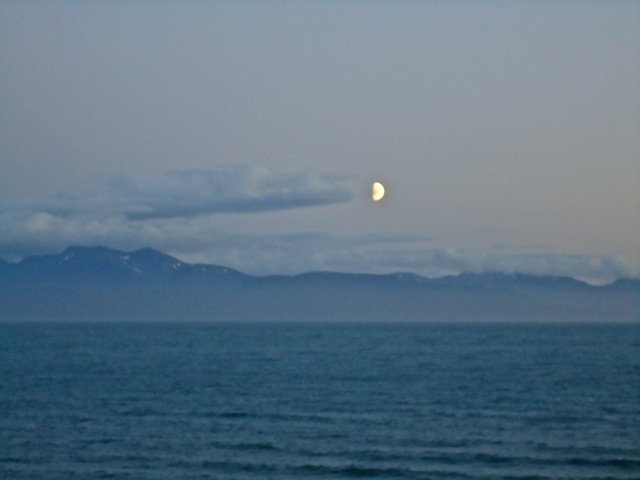 Although we did not see any aurora (northern light 北極光) we were treated to interesting sights in Alaska. This moon seemed to shoot across the sky trailing a jet exhaust behind it. 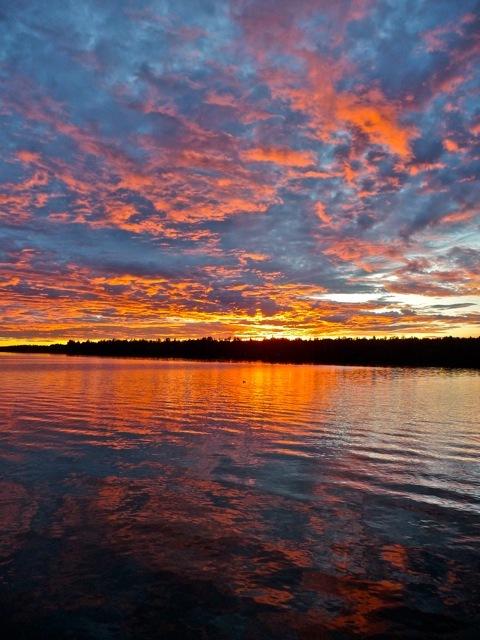 The sky was on fire at sunset in Wasilla. We tried to visit Sarah Palin, but we could not find out where she lived. 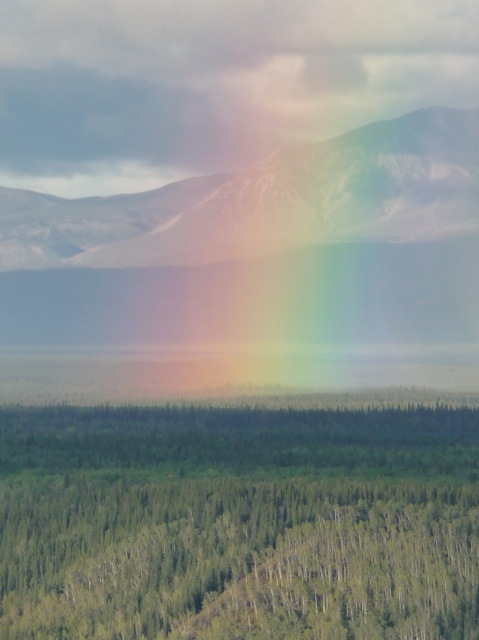 We saw the most vivid and colorful rainbow after driving 8 hours from Fairbanks. Since king crabs are caught in Alaska, we thought we would eat the best king crab there. 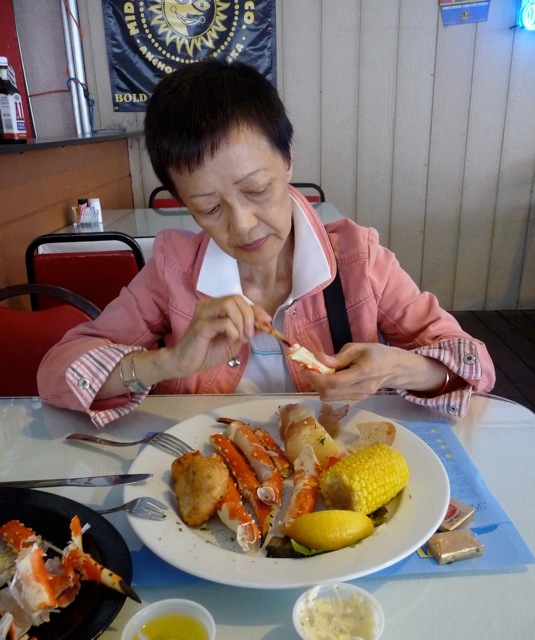 The two time we ordered king crab in restaurants, the shell were rubber-like, and the meat was overcooked. And they were not inexpensive either. After one week of eating Western food, we died for some Chinese food. We had beef with broccoli and cashew chicken. They were very satisfying. In Seward, two Chinese restaurants were located one block apart. While every restaurant in town charged good prices for simple dishes, these two had a cut throat competition by offering low priced buffets. We saw our share of accidents. 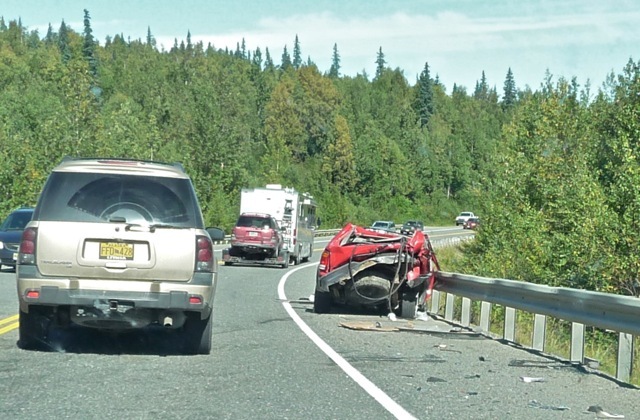 This car collided with a truck towing a trailer RV and was crushed. Its roof had to be cut to rescue the driver. The trailer RV overturned. 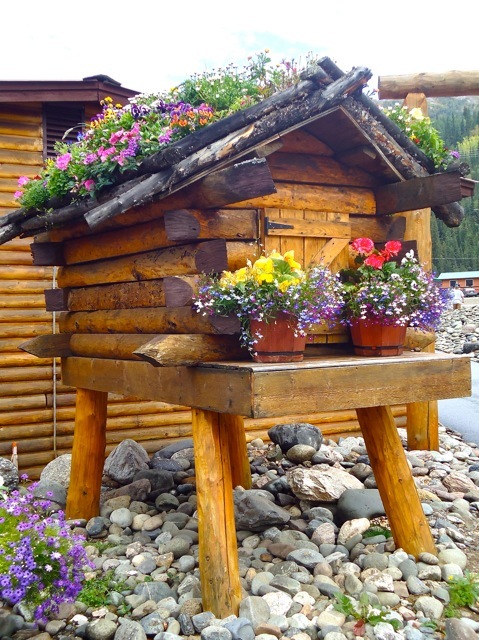 As Alaska depends heavily on tourism, its toilet facilities were first rate. These neat, clean dry toilets had huge chimneys that drew all odor from the toilets, and they were a joy to use. They even had disinfectant liquid dispensers to clean hands. Sally is allergic to strong sun. 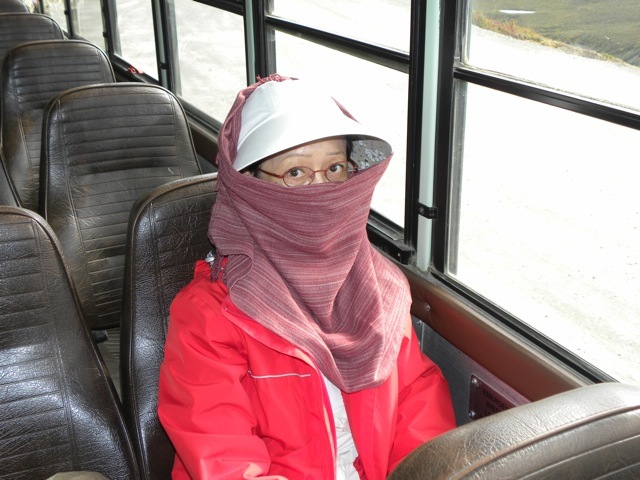 She fashioned a make-shift but effective burqa to shield her face. 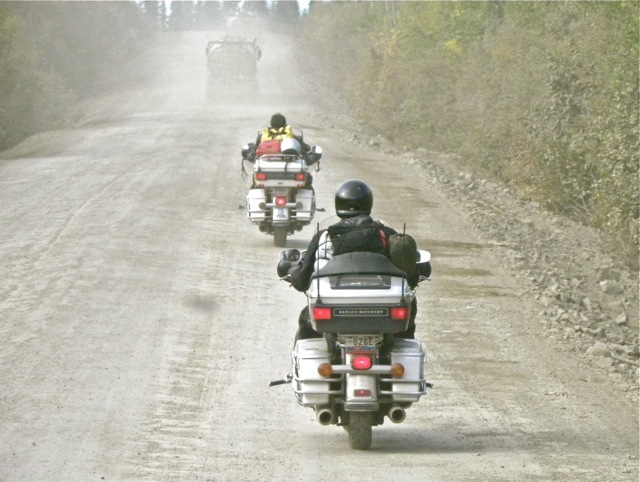 On our way to the Arctic Circle, we saw lots of trucks hauling big loads on the gravel Dalton Highway. These two motorcyclists carried camping equipment to do some primitive and demanding camping. 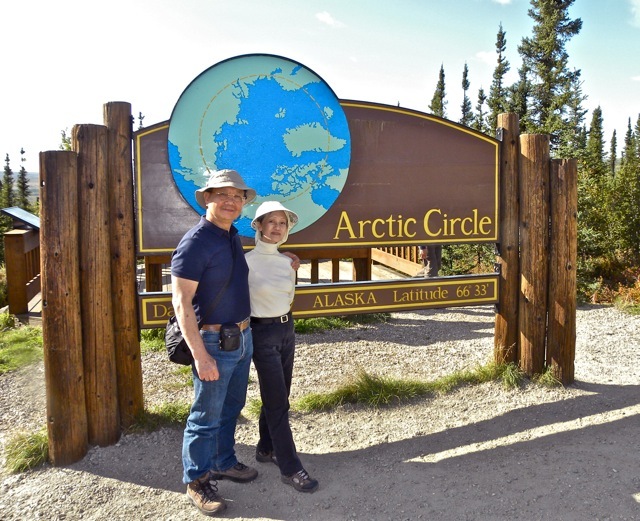 When we crossed the Arctic Circle, we had our obligatory picture taken. On our way back, our tour van had a seized alternator. Another tour van came by and took us back to Fairbanks, but it did not do it out of charity. It charged our tour company $70/person for this one-way trip. Since our tour costed us $175/person, the one-way fare was cheap. In the Fairbanks Museum, I put on a caribou antler and a hunting parker. Seriously, do I look good as an Eskimo? 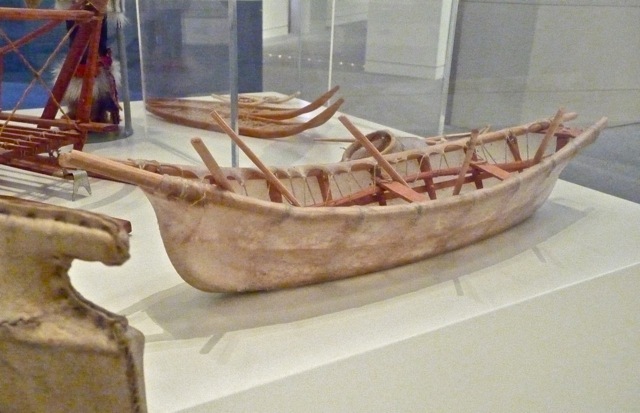 The museum showed models of seal skin boats. I decided to make a skin boat model like this one, sometime in the future. 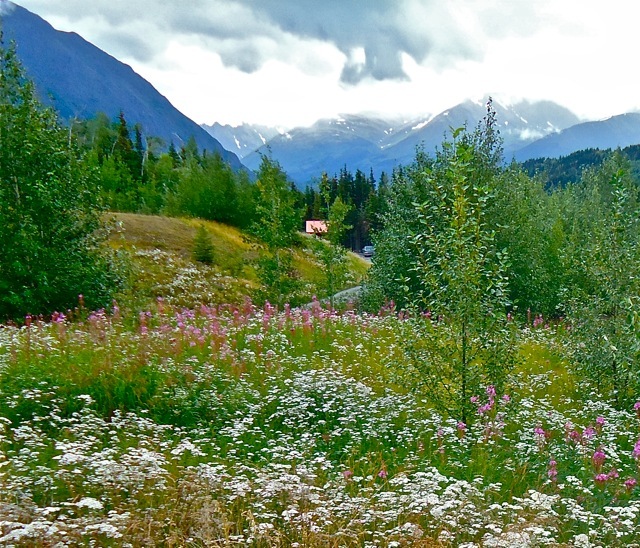 Alaska has a short growing season for plants, but the sun shines long hours each day. 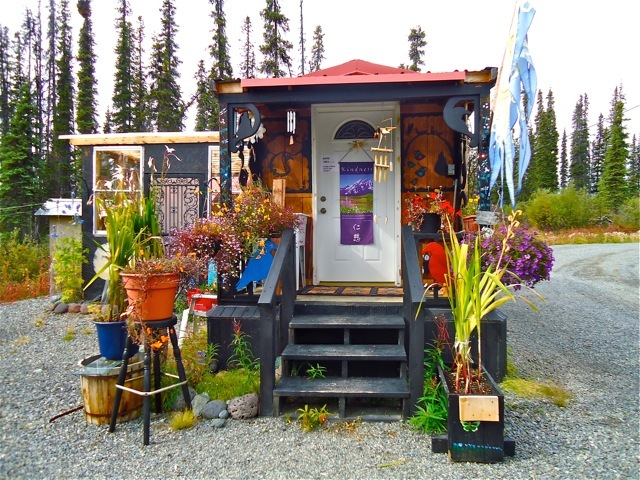 Alaskans take advantage of the growing season and plant many flowers. 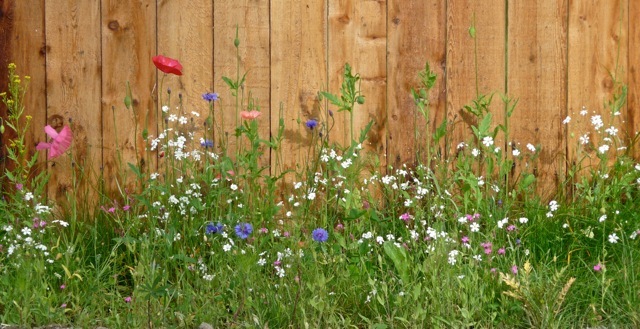 These lovely flowers by a wooded fence were light hearted and happy. Large hotels spend lots of money to grow flowers everywhere. The profusion of flowers make flower-lovers like us very happy. Alaskans used to live in small log cabins. They had to put their out-of-season household items in small outdoor storage cabins built on poles to keep them away from animals. 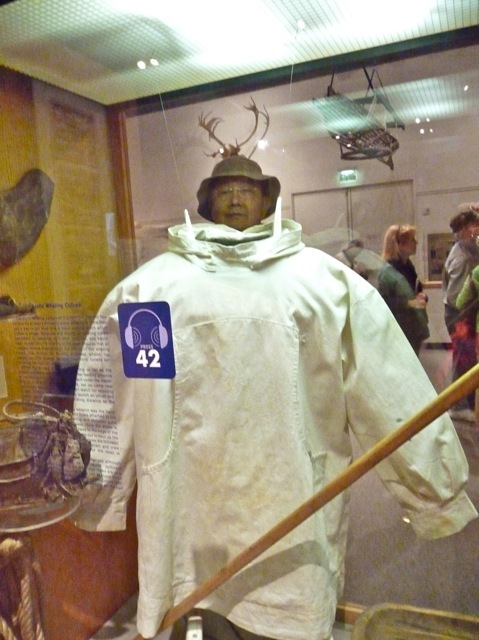 These caches are not used now, but they are built as a memorabilia of traditional Alaskan life. 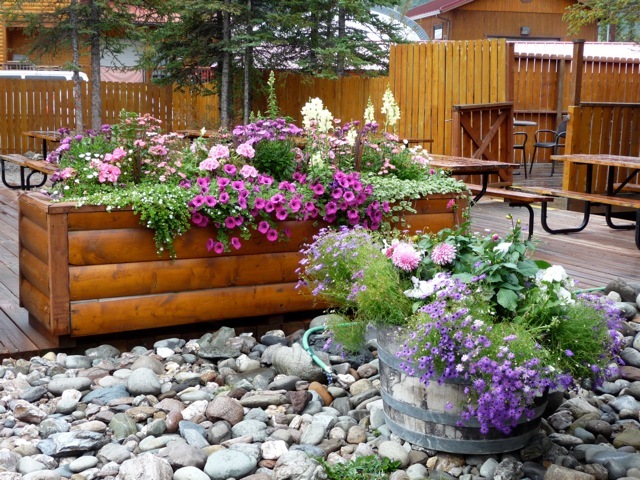 Some are used as flower planters and they are beautiful. Humble households also plant lots of flowers. This house next to a pond planted lovely flowers by the water. Even simple roadside cafes were elaborately decorated with flowers. But for us, the most beautiful flowers were found in the wilderness, on mountain meadows, by roadsides. 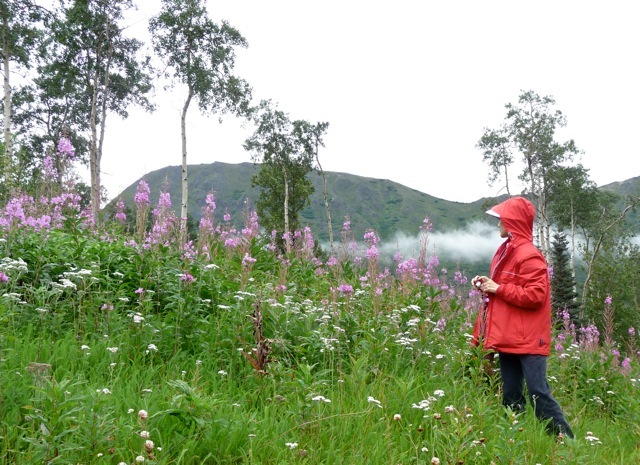 One flower that we will always remember is the fireweed. 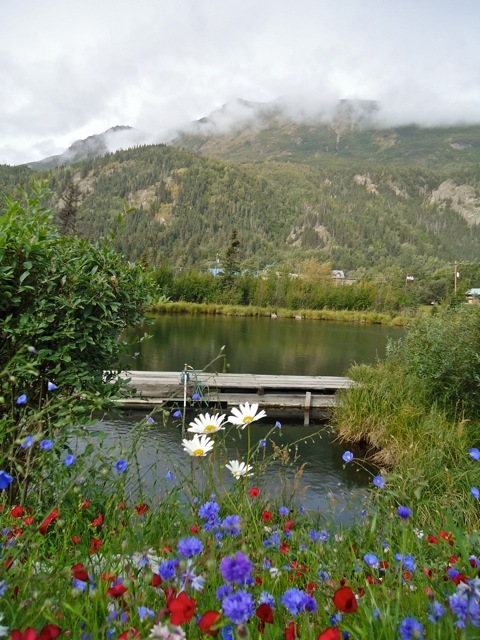 They bloomed in profusion when we visited Alaska and were visible everywhere. Their magenta color and graceful shapes attracted Sally to take hundreds of pictures of them. Posted by Robert Wu on Sunday, September 5, 2010, at 9:46 pm. Filed under Uncategorized. Follow any responses to this post with its comments RSS feed. You can post a comment or trackback from your blog.